Director Institute Next Generation Directors is a world class board search and advisory firm with headquarters in Sydney, Australia. We have developed and maintain an exclusive powerful network of Board candidates that is always an initial source of discussion with our clients, with a focus on the ‘new breed’ of board director capable of dealing with today’s directorship issues and challenges. We have a highly developed research capacity, excellent contacts and director networks across Boards in Australia, and a reputation for creativity and analytical ability that allows us to identify candidates from ‘outside the square’. All of our candidate shortlists will include a diversity of qualified people to encourage the client to consider real options for improving the quality of Board composition. Our Board Search and Advisory services are guaranteed. Confidential board search and selection assignments are always handled personally by Director Institute’s Founder & CEO Kylie Hammond, supported by our team of principal and research consultants with deep expertise in identifying top board director talent for our clients. Assignments include search and selection for Chairman, Non-Executive Directors, Executive Directors and Advisory Board members. Our exclusive Board Search services are charged on a set fee basis, which is negotiated with the client prior to commencement. This fee is dependent on the remuneration paid for the position, the scope of search required and the extent of assistance required from Director Institute. Our Board Search & Advisory services can range from simply providing a ‘prompt’ list for a Nominating Committee to a full Board Search service with advice on appointment and remuneration. For Not-For-Profit clients we are able to negotiate acceptable fees, in line with their charter. Exclusive terms of business are also offered to Start-Up and High Potential businesses during the capital raising process. Complimentary Board Vacancy Advertising, Director Institute Next Generation Directors are proud to provide our Board Search Services free of charge to Not-For-Profit and Public organisations in Australia. Register your Board Vacancy today to gain access to over 50,000 board directors, advisory panel members and investor directors. For a confidential discussion and more information please phone 1300 BOARDS or 02 9967 2121. Set-up an Employer Login – Click register as an employer. Provide information about your Board Vacancy. 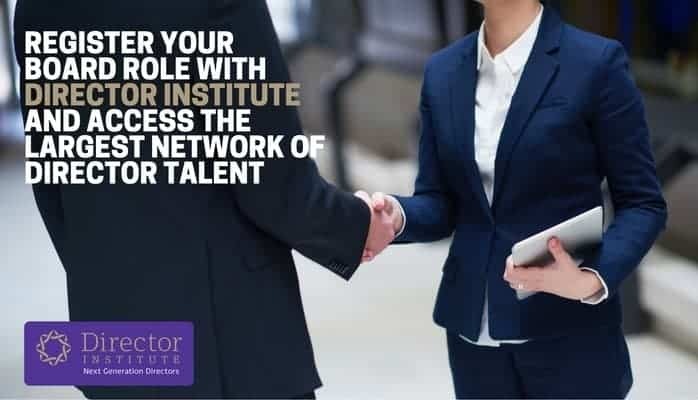 Once you have posted your director opportunity on the Director Institute job board you will be connected to our network of high calibre advisors and directors. When you fill in the details about your available opportunity please provide as much information about the role to ensure that you receive applications from the most suitable candidates. All roles are first screened by our Board Search director who will then approve the role for publication through-out our network. If you would like further assistance with your recruitment process please send an email to info@directorinstitute.com.au with your contact details.